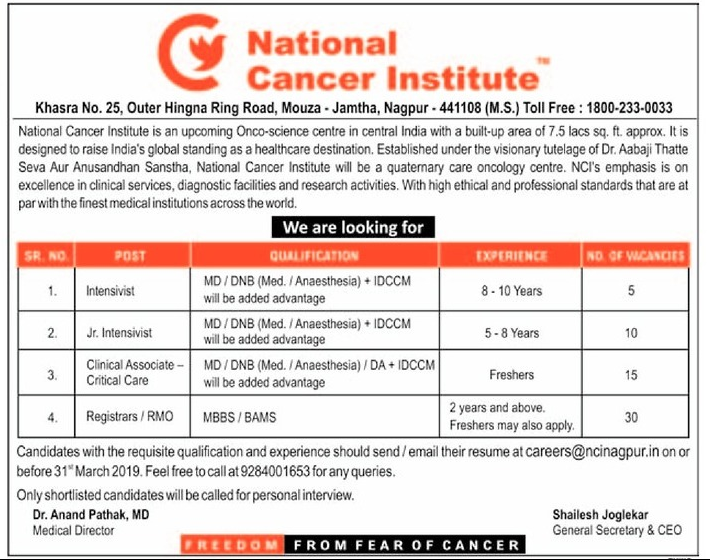 NCI Nagpur (National Cancer Institute Nagpur), Nagpur published a new job notification for Intensivist, Junior Intensivist, Clinical Associate & Registrars/ RMO Posts. The recruitment is for total 60 Vacancies. The willing candidates are informed to see the latest notification March 2019. Qualification required MD/ DNB + IDCCM/MBBS/ BAMS and More. Last Date of offline application is 31-03-2019. For More details of NCI Nagpur Recruitment 2019 Read Below. Interested & Eligible candidates can send their application along with all the necessary documents and testimonials Email to careers@ncinagpur.in. Application starts offline 27-03-2019. Last Date of application is 31-03-2019.